With every additional meter of hub height added to a wind turbine, the annual energy yield increases by 0.5 to 1 percent. Reduced wind turbulence resulting in significantly better wind yield speaks in favor of hub heights over 130 meters, especially at inland locations with weak wind. This delivers a faster return on investment (ROI) for the entire project. With new hybrid towers, hub heights of up to 180 meters can be realized economically. This is possible thanks to a unique combination of precast concrete parts and steel elements. They even can be manufactured locally in a mobile factory. 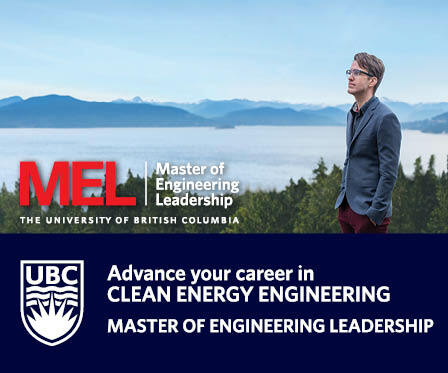 A pilot plant combining wind turbines and pumped storage is breaking new ground to further increase the efficiency and yield of wind turbines. Last year the world's tallest wind turbine, with a hub height of 165 meters and an overall height of 230 meters, was built in Germany. The facility in Bickenbach demonstrates what is possible at great heights. Here, a new hybrid tower system was used. Hybrid towers deliver greater yield and high efficiency, especially inland. As far as the heights of wind turbines are concerned, there is great potential, particularly in North America. The tower consists of a concrete foundation poured in place, with 60 to 100 meter concrete elements assembled on top, using modular construction. The concrete elements can be combined to create towers of different heights and shapes according to a modular system. Individual tower types are designed to precisely match the static-dynamic and customer requirements of the systems. A special segment geometry and cylindrical rings as spacers make these great heights possible, as well as the customization to suit project-specific conditions. During production, the concrete elements are machined to one tenth of a millimeter using a CNC milling machine. This makes it possible to then stack the rings precisely on top of each other – using dry joints, i.e. without mortar or other compensating layer. The steel tube is finally added for the tip at a height of 120 to 180 meters. Using hybrid construction, it becomes possible to find the economic optimum for the required tower heights. The concrete component is completely maintenance-free and especially durable. In addition, with the strong concrete section and more flexible steel tip, the hybrid system ensures improved structural stability over pure concrete or steel towers. The modular design and simple "stacking" of the rings allow fast construction in one week, under any weather conditions. For international projects, a modified hybrid tower system and mobile on-site manufacturing can be worthwhile. Here, the CNC-machined concrete segments are smaller. At the wind turbine site, a mobile manufacturing plant is set up, which assumes production of the concrete elements, using local workers and local materials. This creates added value on site, increases “local content,” and significantly reduces the number of heavy transports. The high quality standards of factory manufacturing are also maintained in the mobile factory; it was only necessary to adapt the equipment and processes based on seven years of experience in the production of the concrete segments. Because of the smaller segments, it is possible to serve several wind farms at the same time, or locate the mobile factory between several wind farms, which increases the "local content". Currently, a power plant combination in Gaildorf with a new and unusual design and usage is being launched. It complements the hybrid tower system with an energy storage option. A pilot plant connects four wind turbines with pumped storage tanks, whereby the turbine foundations serve as water storage tanks. Pipelines connect them with a hydroelectric power station and a corresponding lower basin 200 meters below, in the valley. The idea is that, where large concrete foundations are already being erected on a mountain, these can be extended to include water basins. This reduces the need for conventional pumped storage (for which the largely-unspoiled landscapes traditionally undergo massively transformation). If wind turbines are unable to produce electricity because the wind is weak, but the grid requires electricity, water flows from the reservoirs into the lower basin and drives a turbine that produces electricity with a generator. 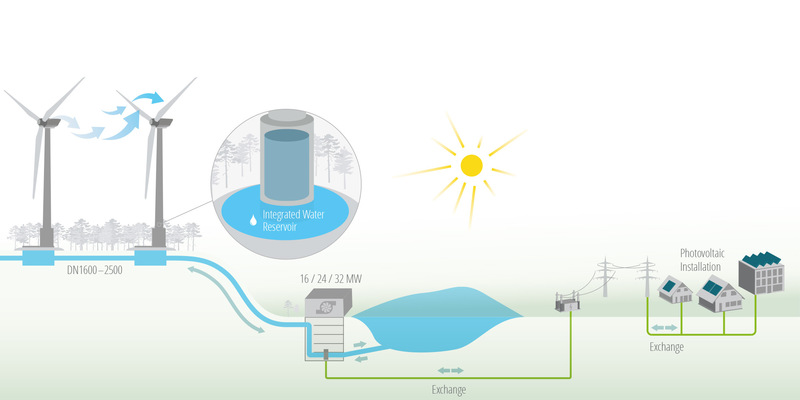 If the plants supply more power than they can feed into the grid (for instance, during strong winds), water is pumped back into the reservoirs using the excess energy. The storage system can function independently as well as flexibly, to store externally generated excess power. Each of the four wind turbines has two water tanks, one in the pedestals with a diameter of 16.8 meters, and one at a height of up to 40 meters. With this modular design, the extended tower footing is used for water storage. 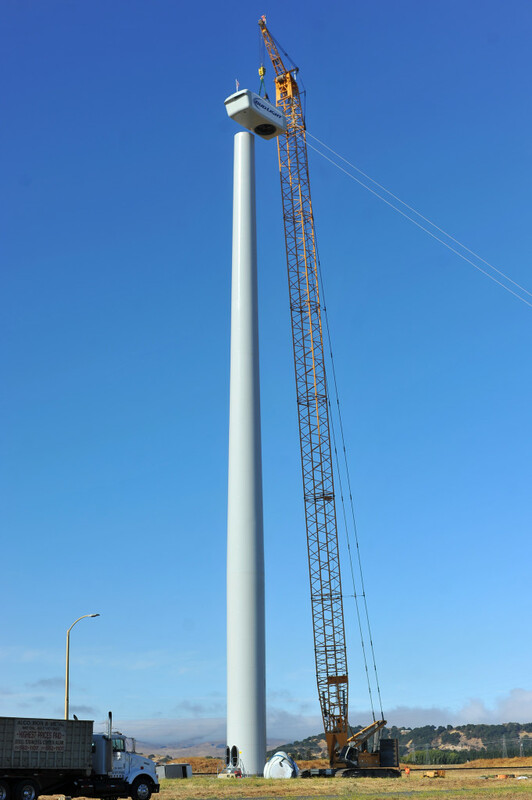 As with a standard system, the foundation for the wind turbine is installed on the base and then the tower is installed. This increases the height of the existing system by up to 40 meters, increasing the hub height accordingly. After completion, the pilot system will be the tallest wind turbine in the world, with a total height of 243.5 meters and a hub height of 175 meters. When the water storage is needed to deliver power, the base storage is emptied first. Additionally, there are four large open basins, with a diameter of 63 meters and a water level of up to 15 meters. These accommodate the bulk of the water volume, and are used after the base storage. Each reservoir has a volume of 40,000 cubic meters. 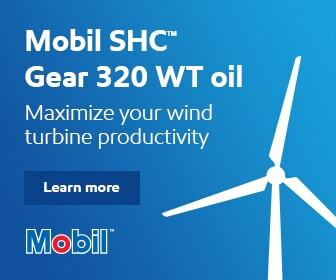 The plant is expected to supply around 2,200 full load hours and 40 gigawatt hours per year. The pilot plant will reach a storage capacity of 70 megawatt hours. Seventy percent of the performance can be activated within thirty seconds. The modular construction concept enables the linking of a different number of systems, and the ability to equip the power station in the valley with three performance classes of 16, 24 or 32 megawatts. 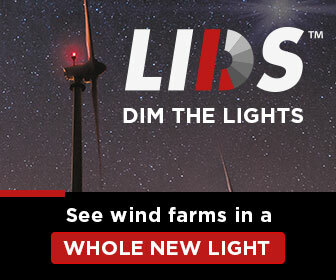 The potential for harnessing wind power is far from exhausted, both in hub heights and extended utilization forms.